Muka laka hiki, and welcome to another wonderful Tuesday, Hawaiian-style. I wanted to let you all know that Ibiza in the Hotel Andaluz will be hosting a Kona tap takeover on Thursday, Aug. 16 Thursday, Aug 16 from 6-8 pm. For $8, you get four 3 oz. 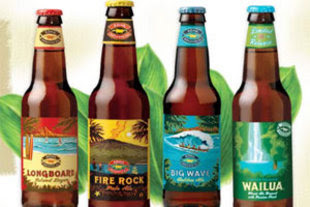 samples and 1 pint of your choice of Kona Longboard Lager, Kona Wailua Wheat, Kona Firerock Pale Ale or the new Kona Big Wave Blonde Ale. These tap takeovers are a regular feature at the hotel and aren't filled with the regular Andaluzers you might expect to run into, so stop by and enjoy some Hawaiian beers.